Quinoa in a quesadilla? I would have never thought of that. Brilliant. Thanks! These are so clever! Will definitely be making these and you have convinced me about cast iron. I will be on the hunt for a deal now! Thanks again! 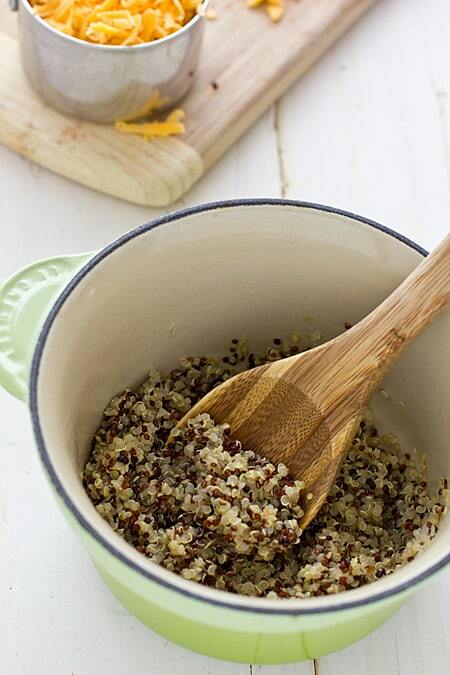 Quinoa is wonderful! I’m learning many ways to use it! 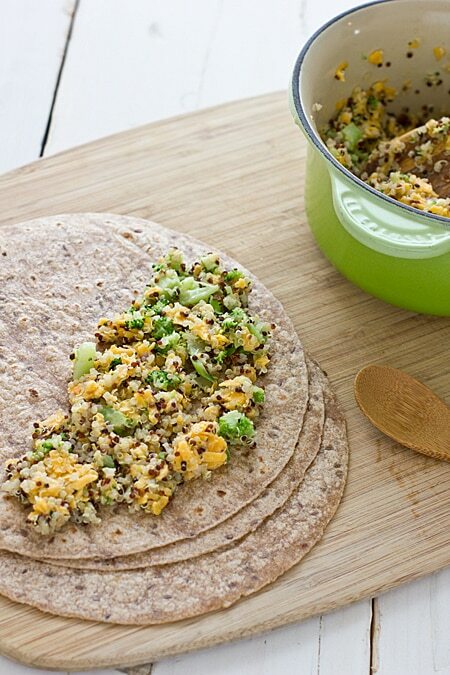 Love the idea of adding quinoa to a quesadilla. Yum! 🙂 I think I’ll add this to the menu plan this week. Guaranteed hit in our home. I’m a huge cast iron fan too! I recommend looking for them in thrift and antique stores – sometimes you can get a great deal on a pan – and it might even be pre-seasoned already! I don’t own any cast iron pans even though I know I should .. It’s funny I just had one in my hand last weekend because there was a really good sale on one, but I ended up deciding I would probably never use it because they scare me too much haha .. I wish I’d read this first! Love the paninis too – I never would have thought to put quinoa in one! And obviously I meant quesadilla, oops! Well, it’s funny, this recipe was originally a panini and then I decided to make it a quesadilla instead. 🙂 And don’t be scared of cast iron! There’s a little bit of a learning curve, but once you get the hang of cooking with & caring for them, they are so great to use. This looks SO good and amazingly simple! Love it :). It’s like you jumped inside my brain, took all of my favorite things ever and made them into a quesadilla! This is happening! I love cast iron! Though I haven’t sworn off nonstick yet. And I feel like the black non-enamel has better nonstick properties — food seems to stick to the enamel more, and I don’t want to use too much oil. Do you use only certain brands? I love my Le Creuset pieces and my Lodge non-enamel frying pan, but a Martha Stewart dutch oven I had a few years ago had chipping enamel. It was way cheaper than Le Creuset, but got tossed. I have a Lodge skillet, but all the rest of my cookware is Le Creuset. I absolutely love it–I’ve been using it for years and haven’t had any problems with chipping. I truly need le creuset cast iron in my life! 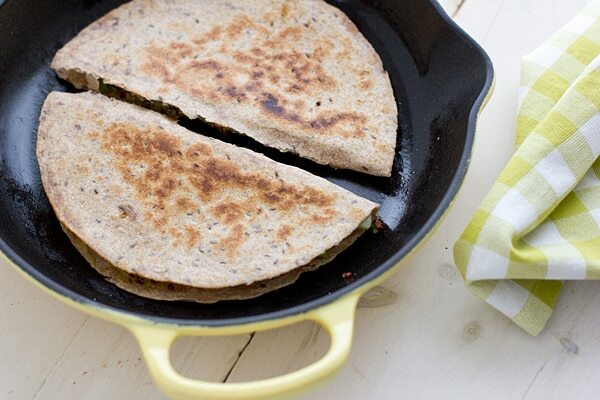 Love this quesadillas and the use of quinoa. Never thought about it! I would love to have a le creuset cast iron…only wish they were not so pricy. Great tips on cooking with cast iron. An added benefit to the non-enameled variety is that it also adds iron to your food! this is really useful – i’ve been wanting a cast iron skillet for months now and it is interesting to see what a difference they make! And when you use cast iron, you get a little more iron in your food! Or so I’ve heard. Another thing I heard last week (from Erica of NW Edible who spoke at a home and garden show here in Seattle) is that you can wash your cast iron skillet (especially if you have too much rust, usually because you haven’t been using it) with kosher salt and a lemon half. I can’t wait to have a little rust to try that one out. I have a quesadilla post lined up for this week, myself! Mine is far less classy than yours though. I actually tried to make a broccoli cheddar quesadilla a few weeks ago and was underwhelmed, but mine lacked both sharp cheddar and the brilliant addition of quinoa. These look much, much better. I use cast-iron almost exclusively for my cooking. I’ve been able to get good deals at garage sales on all kinds of sizes of cast-iron. With some scrubbing and care I was able to salvage 8 pans that looked awful. 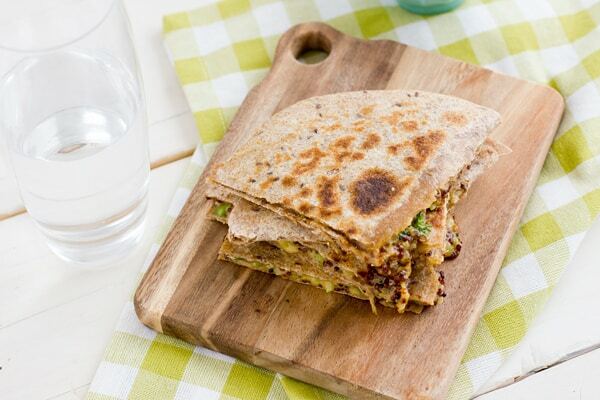 I never thought to put quinoa in a quesadilla, I like it! So now I know why I burn food in my cast iron skillet…it kinda got put in “time out” after one very frustrating and glued on mess! Leaving it sit with oil in it, does that create a more non-stick surface? And do you have to do that every time you use it? Yes, with a regular cast iron skillet, you’re supposed to oil it after each use. You can put a paper towel on top of it to keep it from collecting dust (or in my case, cat hair!) while it’s not being used. The more you cook with it, the more non-stick the skillet becomes! I live in a not-so-upgraded apartment complex and we have pretty old electric stoves. I think they might be older than me. The great thing about cast iron is it distributes heat evenly so I never have one side of the pot being hotter than the other. With my stove having so many issues, its sooo nice not having to worry abou that. Your cleaning tips are great BTW. I have the black cast iron and personally love it, although I can sympathize that I never feel like it is clean. Are they the electric stoves with metal coils? We lived in an apartment with those and they are the worst–the worst! Oh, how I hated those things. They were so hard to clean too. Yes… they are the metal coils. They really are terrible. I can not WAIT to move (hopefully somewhere with a better kitchen).